DISCOVERY Join a full-day Guided Tour to the magical Black Forest to experience the Vogtsbauernhof open-air-museum, visit an authentic water mill, and see a traditional Bavarian butter-making demonstration. ACTIVE Join your Avalon Adventure Host for an early Morning Walk. CLASSIC Join a City Tour of Strasbourg’s sights, including gothic, stained-glass cathedral with its celebrated ancient murals and astronomical clock, as well as the magical La Petite France District. ACTIVE Take an open-air Cable Car Ride to the Niederwald Monument, then ride or walk back down through the vineyards. DISCOVERY Take a Guided Tour to Seligenstadt—one of Germany’s oldest towns and home to the Einhard Basilika—dubbed “minor basilica” in 1925 by Pope Pius XI. CLASSIC Take a Guided Walking Tour of the historic home to imperial dynasties, and see its Romanesque cathedral, Old Town Hall, and seven hills crowned with churches. 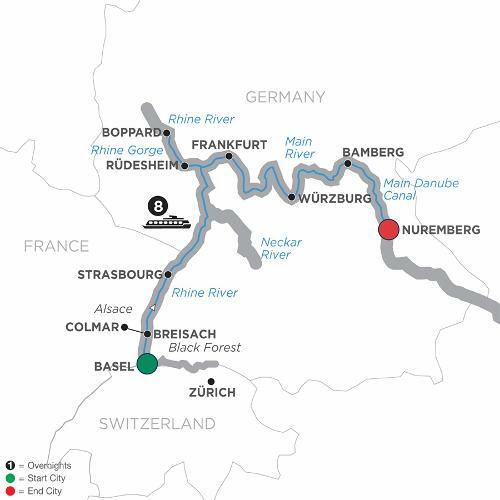 Your picturesque European river cruise begins on the Rhine River in Basel, Switzerland. You’ll sail to Breisach—with your choice of a guided tour of charming Colmar, or an excursion to the Black Forest. Sail to the city of Strasbourg, France, along the way, and on to the wine village of Rüdesheim through the spectacular Rhine Gorge. The modern and charming city of Frankfurt is also on your route along the Rhine River, and you’ll sail on the Main River to visit an authentic Main river village on your way to Würzburg. Take a guided tour of Bamberg, before reaching Nuremberg where your vacation ends. Your grand scenic cruise of Germany brings the beauty and charm of its cities and villages to life. From Switzerland to Bavaria, your German vacation will stay a beautiful memory for years to come!